Albert Einstein? B. F. Skinner? Edouard Herriot? C. F. Thwing? Ralph Waldo Emerson? Agnes F. Perkins? James Bryant Conant? E. F. L. Wood? George Savile? Lord Halifax? Anonymous? 1) Culture is that which remains with an individual when he has forgotten all he learned. 2) Culture is what is left when what you have learned at college has been forgotten. 3) Education is what remains after one has forgotten everything he learned in school. 4) Education is what is left after you have forgotten all you have learned. It would be possible to split this set into two subgroups: adages for education and adages for culture. But all the statements conform to the same underlying template, and this leads to a natural collection. The French Prime Minister Edouard Herriot has been linked to the saying about culture. The famous physicist Albert Einstein and the prominent psychologist B. F. Skinner have been connected to sayings about education. Would you please examine this family of expressions? 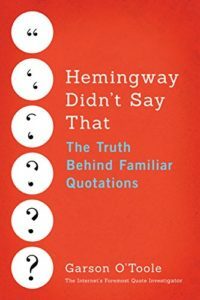 Quote Investigator: This family of quotations has been evolving for more than one hundred years, and instances were already circulating before linkages were established to any of the persons named by the questioner. Newspapers credited Edouard Herriot with a comparable adage about culture by 1928. Albert Einstein wrote an essay in 1936 that included a commensurate remark about education, but he credited the words to an unnamed “wit”. In 1942 E. F. L. Wood, 1st Earl of Halifax employed the remark about education during a speech. Later the statement was reassigned to the 17th century figure George Savile, 1st Marquess of Halifax. QI believes that this attribution was constructed because of confusion between names. In 1965 B. F. Skinner included an instance of the saying about education in an article about teaching, but he disclaimed credit. Details for these citations are given further below.